In the US, Footsore Miniatures is owned by Bill Thornhill, who as well as designing the ranges, also runs the production and the show stands at all the main conventions. In the UK Footsore Miniatures is a trading name for Dark Peak Games Ltd a company owned by Mark Farr and Andy Hobday, friends for over 20 years who collectively bring over 50 years of gaming experience. Mark has been an avid gamer as long as he can remember. Starting with Airfix kits and later moving onto metal miniatures. 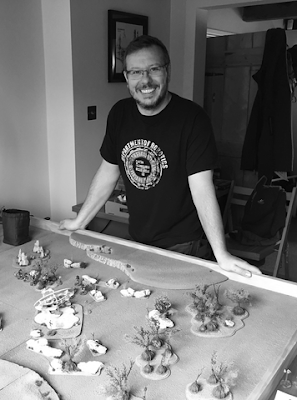 Mark has been through most rule sets over the years starting with the likes of Donald Featherstone and regularly emptying his local library of all their wargaming books (and returning them of course). In the early 80s, Games Workshop released Warhammer first edition and an incurable addiction was born. Mark moved from the’ Marches’ up to Nottingham to work for Games Workshop in Sales and worked his way through several areas of the business learning mould making and casting along the way. After his time at Games Workshop, he also worked for Wargames Foundry and Warlord Games. Mark is a prolific collector and painter owning many miniatures though his first love has always been ‘sword & shield’ armies. Being part of Footsore Miniatures is a dream come true (who wouldn’t want their own Toy Soldier Company) as it ticks all of Marks boxes, nicely detailed easy to paint miniatures in evocative poses and a company with a reputation for high quality and excellent value troops. When Andy’s Dad bought him the book “The Warlock of Firetop Mountain” over 30 years ago little did he know this would be the catalyst for his lifelong obsession with miniature wargaming. From playing lots of role-playing games he came across the first edition Warhammer Fantasy Battles which gave him a reason for owning all the dwarf figures he had collected over his various dungeon adventures. An interest and passion for historical gaming began with the purchase of Samurai Blades by Standard Games and has continued since Samurai (Sengoku period - Warring States) and Medieval (The Barons Wars) being the periods he enjoys the best. Andy has been lucky enough to turn his hobby into a career. Joining Games Workshop in the early 1990s he worked his way around the business starting in the retail stores and ending up at Head Office in Nottingham as Head of IT (UK Sales). Andy has also worked for Warlord Games as their IT manager and championed their Beyond the Gates of Antares Sci-Fi game which he plays a lot. He was the author of the Strike on Kar’A Nine introductory book having conceived the new Antares introductory box set. He is also the co-creator of Test of Honour the Samurai Miniatures game with Graham Davey - which was released March 2017 by Warlord Games. Outside of Warlord Games, he likes to play SAGA as often as he can where he fields other manufacturers Vikings (don’t tell Bill) scratching his Dark Ages itch. 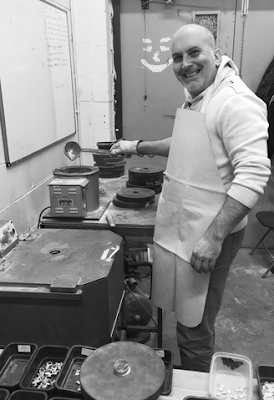 Owning his own miniatures company, including his own casting machine is the dream of the 14-year-old Andy made into reality. Andy lives in rural Nottinghamshire with his wife, two daughters and awesome dog Huxley. War Banner are thrilled to announce that we have entered into a partnership with Hysterical Games. As of the 1st April 2019 War Banner Limited will become Dark Peak Games Limited, this is no April fools day joke.